Cut 3 small cored pears each into 8 thin wedges. Place in a small roasting tin, dot with butter and, using a small sieve, dust with 1 tsp each of ground allspice and cinnamon. Roast for 20–25 minutes at 180°C, gas mark 4, until tender. Meanwhile, toast thin slices of halved bagel then spread generously with Waitrose Faux Gras Duck Liver Pâté. 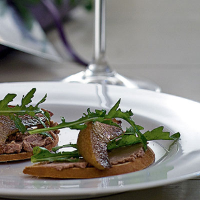 Serve each bagel topped with a pear wedge and a few fresh rocket leaves. Leftover spiced pears served with Greek yogurt make a delicious breakfast.